Micronexx has synergistic teams who bridge the gap between the art of marketing and the science of technology. Micronexx brings this expertise to bear on electronic marketing by combining the creative and strategic marketing concepts developed by our E-marketers with the nuts and bolt technology created by our engineers. Business software is not a one-size-fits-all proposition. Sometimes, the software you need doesn’t exist. Finding and running an in-house team of developers isn’t practical. If Micronexx doesn’t have the solution you need, let us build it. With over 25 years of experience developing software for manufacturers, publishers and retailers , we have the experience and skill to put technology to work for your organization. 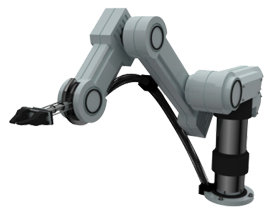 Micronexx can help your business to implement state-of-the art robotics, vision systems and custom designed peripherals to reduce costs, change-over times and inventory, while increasing throughput and quality. We can couple robotic and line automation systems with front end web commerce software for true, end to end value. Whether you need help with CNC fabrication, pick and place robotics or process scheduling, the experts at Micronexx can help build the right solution for your business. Ready to move your business forward? Reach out to our dedicated and courteous representatives to discuss how Micronexx can put technology to work for your organization. Want to interact with us? Reach out to us online and join the discussion.